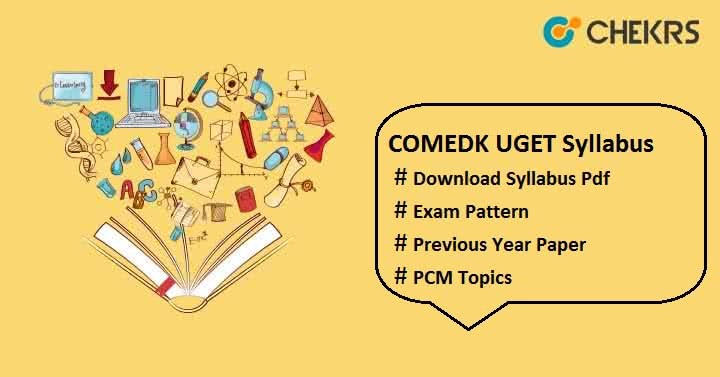 COMEDK UGET Syllabus 2019: COMEDK UGET is an entrance exam conducted for candidates wishing to take admission for undergraduate engineering courses. Candidates, who are still looking for COMEDK exam stuff like syllabus, exam pattern, previous year paper etc, are advised not to waste their time. We have brought COMEDK Syllabus to help those candidates who still do not know what to study or what not to. The exam syllabus is similar to class 12th syllabus. Those who have completed their class 12 physics, chemistry & mathematics syllabus need to check COMEDK UGET Previous Year Paper. Here we have provided the COMEDK Engineering Syllabus with topics. Go through the syllabus and start your exam preparation from today to perform in a better way. The examination controller will decide the exam pattern of COMEDK. All candidates who want to know the exact paper pattern may check the given COMEDK Exam Pattern here. It will tell you type of question, marking scheme, no of question per subjects, weightage of each subjects, etc. You must check the pattern before starting the preparation; it will clear your all doubts regarding the question paper. You can also check last time preparation tips to crack this exam. Students should first briefly understand concept, note down important points and formulas and revise them on regular basis. Try to solve 10 mock test papers to increase your speed and accuracy. Here we have provided the complete information about the exam syllabus with pattern. Still you have any query regarding COMEDK UGET Syllabus 2019; you can leave message in the comment section below.